Here are two pictures I took during my honeymoon last August. This is Meteor Crater, also known as Barringer Crater -- a very large hole in the ground in eastern Arizona. It's 4,150 feet wide and 570 feet deep. Dess and I stood near the rim with the evening summer winds blowing very hard at us -- but not quite hard enough to throw us in. The picture below was taken the next morning. 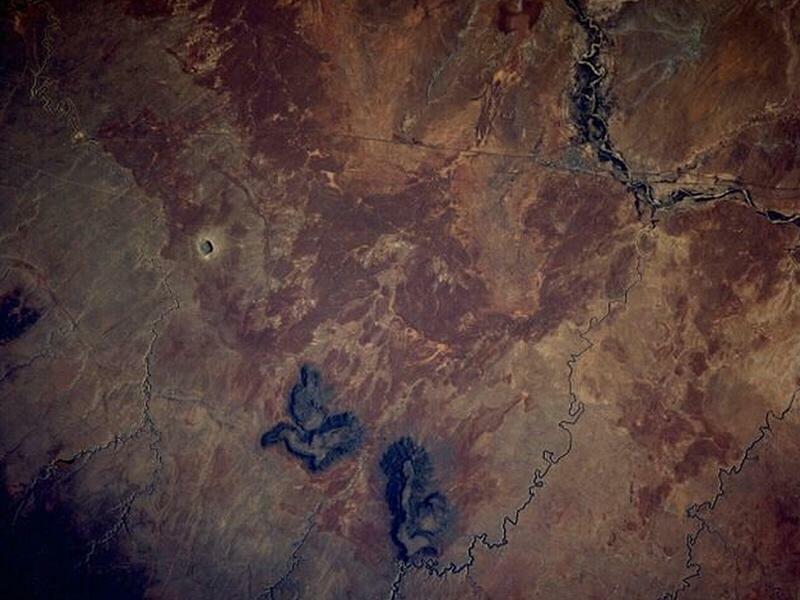 The Crater shows up quite nicely on Google Earth, especially if you tilt the view; then you can actually make out a depression in the earth. The surrounding rim, which rises 150 feet, is noticeable. Look for it about 20 miles west of Winslow, AZ (the coordinates are 35 degrees, 1 minute, 37 seconds North, and 111 degrees, 1 minute, 22 seconds West). On the web there's an estimate that the meteor was 150 feet across (compared to the one that is proposed to have caused the extinction of the dinosaurs, at perhaps 10 miles across). It weighed roughly 300,000 tons, and was traveling at a speed of 40,000 miles per hour. The force generated by its impact was equal to the explosion of 20 million tons of TNT, or about a thousand Hiroshima bombs. 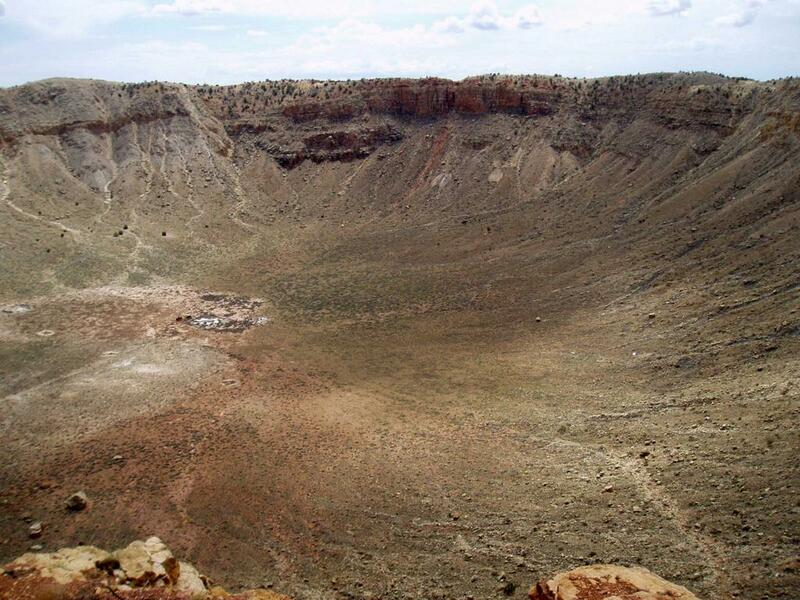 (A few nuclear bombs have been more powerful than Meteor Crater). It happened about 50,000 years ago, which was probably well before humans had ventured into the Americas from eastern Asia, although these days theories are being overturned so fast that you never know. The most interesting thing I learned from the onsite tour? That the native inhabitants of this land probably stayed away from the crater and regarded it as an evil place. 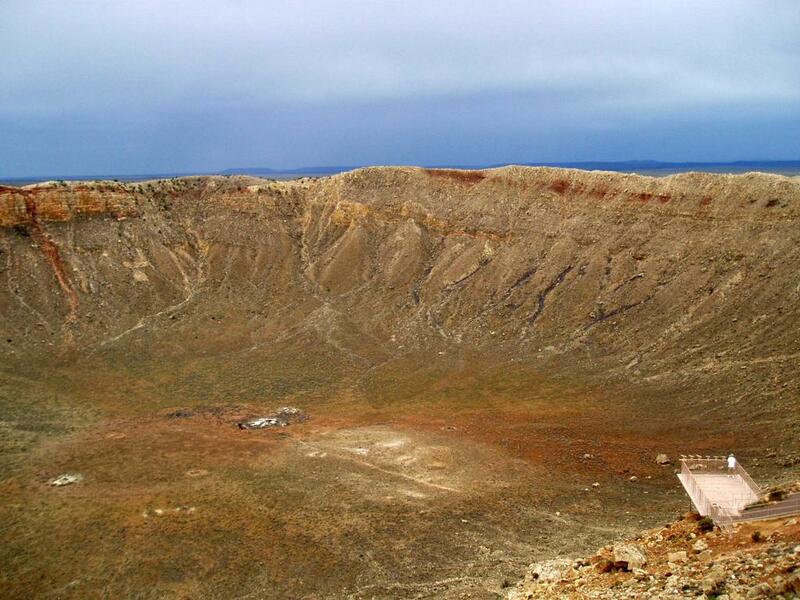 A great site about the crater is here.